Alex de Vries, a blockchain specialist at PwC, has published a report that cryptocurrency mining will be consuming approximately 0.5% of the world's total electricity by the end of 2018. The popularity of Bitcoin has reached astronomical levels in Q1’18 and has spurred in excess of over 1600 cryptocurrencies in existence. This amounts to $369 billion in market cap. A new study by PriceWaterhouseCoopers Alex de Vries has revealed that Bitcoin will be consuming about 0.5% of the world’s total electricity by the end of 2018. 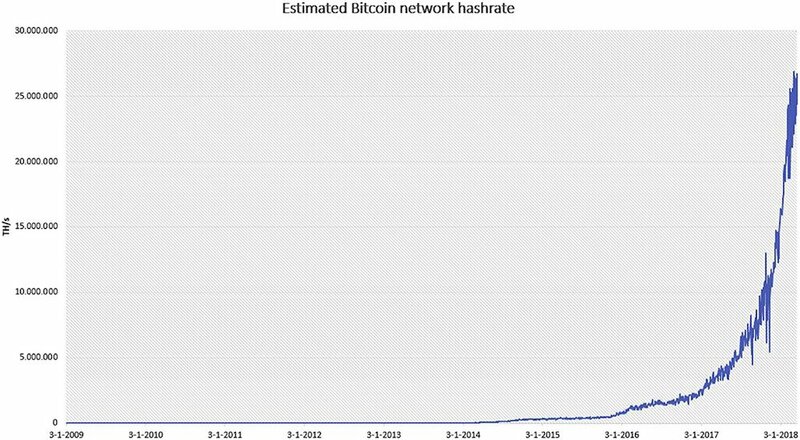 These estimates are based on economics, taking into consideration the current usage of Bitcoin estimated at 2.55 gigawatts. At current levels this equates to Irelands current total energy demands. “The Bitcoin development community is experimenting with solutions such as the Lightning Network to improve the throughput of the network, which may alleviate the situation. For now, however, Bitcoin has a big problem and it is growing fast.” By the end of 2018, the network has been projected to triple at 7.7 gigawatts, which means that the energy needed would be equal to Austria. “To me, half a per cent is already quite shocking. It’s an extreme difference compared to the regular financial system, and this increasing electricity demand is definitely not going to help us reach our climate goals,” the De Vries said. If the price of Bitcoin continues to increase the way some experts have predicted, De Vries believes the network could someday consume 5% of the world’s electricity, according to the publication.